Cologne - Reigning champions FC Bayern München are set to get things kicked off in the 2015/16 campaign as they play host to Bundesliga ever presents Hamburger SV on Friday evening (kick-off 20:30 CEST/18:30 GMT). A battle between two sides steeped in history is the perfect way to get the 53rd Bundesliga season underway with FC Bayern looking to take their first step towards clinching an unprecedented fourth straight top-flight title. Anything but victory against a side who survived the drop by the skin of their teeth last season would be considered a major upset, but Hamburg aren't waving the white flag just yet. Here are all the stats and facts you need to whet your appetite for the Bundesliga's official season opener. 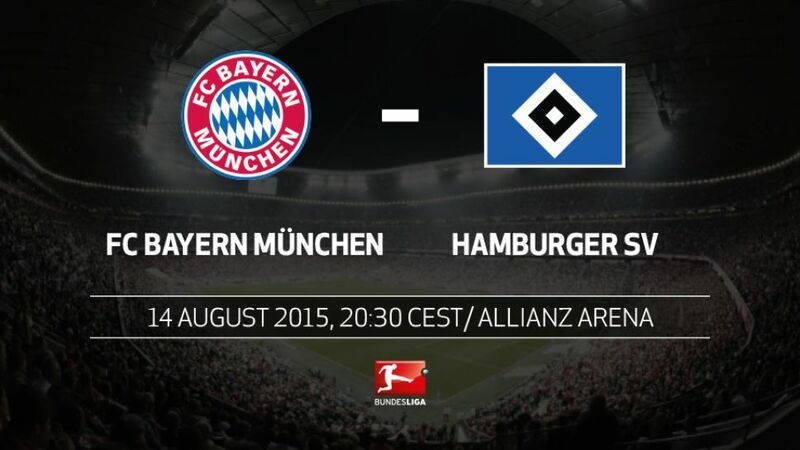 It’s the 101st meeting between FC Bayern and Hamburg in the Bundesliga. Only Hamburg - SV Werder Bremen has been played out more often (102 match-ups). FC Bayern are unbeaten in their last 11 against Hamburg (eight wins, three draws; 35 goals, five against). Mladen Petric scored the only goal of the game in Hamburg’s last win over Bayern on 26 September 2009.In the 100 Bundesliga meetings to date between the two sides, there have only been seven dismissals (HSV’s Atouba, Benjamin, Stein, Spörl and Kovacevic; Bayern’s van Bommel and Boateng). The title holders have never lost since the introduction of the season’s official opener involving the champions (ten wins, three draws). Thomas Müller has scored the first goal of the season twice before. No player has registered three curtain-raising strikes. The opening goal of the season has never been scored by a Hamburg player. Robert Lewandowski has had a say in 11 goals in his last eight appearances against HSV (six goals, five assists). HSV head coach scored 28 goals in 82 Bundesliga appearances for Bayern between 1991-1994.Thomas Müller made his Bundesliga debut in a 2-2 draw against Hamburg on 15 August 2008.